We introduced a related stories element to feature news in October last year. Following a comment on an older blog post, I decided to take another look at the figures. We introduced this new engagement element to encourage staff to visit back-issues of news stories. It is a simple box on the top right corner of the page containing up to 3 text links to related news stories. My initial blog post compared statistics from September and October 2010, resulting in a 53% increase in pageviews over the entire month. A recent comment asked whether related stories are still seeing strong traffic. January 2011 figures are showing a 300% increase in pageviews compared to the initial September 2010 reading. However, figures have remained pretty much constant since January and we are seeing a definite plateau. In October, only those news stories from October contained links to older related stories. Staff clicking on a link arrived at a news story which probably did not have any further related links. 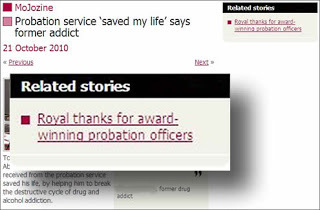 November news stories would start to link to a selection of October news stories which in turn linked to older stories, allowing staff to hop 2 stories into the past. December stories increase the number of possible hops. And as the months progress more and more interlinking will take place. However, it’s important to note that our news editor will not go back to older stories to add on related links to subsequently published stories. So as staff start to hop through the back-issues they will find themselves being funnelled back in time towards October stories and a little bit beyond. In any case, since figures have remained steady since January, it’s logical to assume that staff will only browse back through a finite number of stories. So although the number of interlinked stories continues to grow, the time that staff have to read stories does not. Obviously it would be ideal if the intranet could automatically suggest related news stories based on intelligence gathered from staff interaction with news stories such as sharing, tagging and popularity ratings. For now, it’s good to know that contextual linking remains a valid tool for staff engagement, but it looks like we’ve pushed the manual method to its limits.